Yesterday the Never to Yield Foundation discussed the NCAA allegations that swirled around Newton and Auburn. 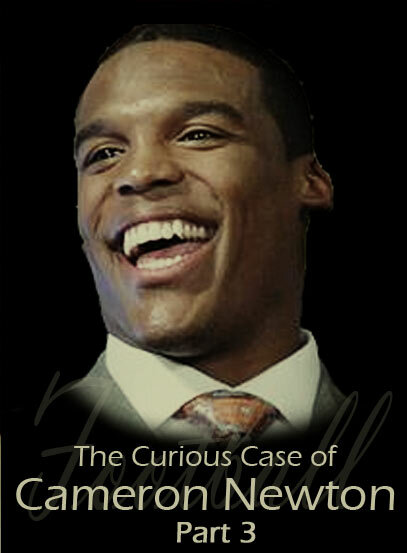 Today in Part III of The Curious Case of Cameron Newton, we look at the real Cam Newton and examine how he, Coach Gene Chizik and the Auburn Tigers endured the storm of allegation and innuendo. July 13, 2011 — The more success Cam Newton and the Auburn Tigers achieved on the field in the late stages of the 2010 season, the more scrutiny they faced off the field. Allegation after allegation, most frivolous, came pouring from Newton’s detractors. It reached the absurd point that traffic tickets Newton amassed while a student at Florida were considered headline news. Newton handled each new spurious allegation with quiet dignity and aplomb. His ability to withstand the assault seemed to enrage those determined to lay him low. His enthusiasm never wavered. His focus never faltered. Under an attack that would have felled a lesser man, Newton and by extension his Tigers prevailed. Most of the ammunition for the rumor mill came from either speculation or faulty information. There were nuggets of truth contained in each, but that small grain of substance was covered in more deep-fried batter than a ten piece bucket of the Colonel’s chicken. It was simply easier to repeat a falsehood than it was to put in the effort to do the research to disprove it. Auburn head coach Gene Chizik claimed that he, the coaching staff and the Auburn players were unaffected by any of the rumor or innuendo then. He says they don’t hear it now. In his new book All In, Chizik wrote that he encourages the team and coaches to look within and ignore the external noise. To achieve that objective, Chizik said he creates a figurative ‘circle’ that includes players, coaches, athletic department personnel and their families. Anyone or anything outside the circle is an imposter. “We find validation only from those within the circle,” Chizik wrote. “Although we respect all those outside our circle, we do not have the time or energy to worry about everyone’s opinion. That’s the perfect stance for a focused team and coaching staff to adopt. Unfortunately it doesn’t make the negative noise go away. Newton found his refuge on Saturday afternoons where he put together one of the most dominant individual seasons in college football history. What was the result of the persistent attack on Newton’s character? He kept smiling. He kept winning. He captured almost every award available to him. He carried himself with class and never fought back. He kept his head when all those assailing him were losing theirs. He did so with boundless enthusiasm on the field and dignity off it. The Carolina Panthers of the National Football League were so disturbed by the baseless assaults on Newton’s character that they made him the first pick of the April draft. Carolina management went on record saying they did their due diligence and chased down the many rumors that swirled around the former Auburn quarterback. As they did, the stories crumbled and they found no substance. “A lot of stories that you heard, when you went and actually checked them out you came away feeling good about Cam Newton as a person,” Carolina Panthers general manager Marty Hurney said after the franchise selected Newton first in the April draft. “Everybody had positive things to say about him. All the time you spend with him, you come away and he’s a genuine kid. A genuine, driven kid. The people you talk to have a lot of good things to say about him off the field. Then they talked about him as a player and in the locker room. They tell you countless stories of leadership. Panthers head coach Ron Rivera added that Newton was the most researched player he’s ever been around. He also confirmed an unprecedented assault on Newton. “The hardest thing was, every time you turn around somebody would call you about something or send you an email about something.” Rivera said. “It got to the point where I called somebody I knew who was connected to the Florida program and I put them on the spot. “You know it’s crazy because you hear all these stories,” Rivera continued. “But then when you confront people with the stories they’d say ‘well, where did that come from?’ I’m telling you it was unbelievable. You begin to wonder why are people saying the things that have been said? Will the Real Cam Newton Please Stand Up? When the Carolina Panthers looked, they found no substance to the rumors that dogged Newton as he completed one of the greatest individual seasons in the history of college football. If Newton wasn’t a strutting punk with a selfish attitude and a checkered past who was he really? If you ask the people who know Newton best, they tell you he’s a humble young man who exudes an aura of leadership and who derives his greatest joy from helping others. Newton became a regular fixture at Wright’s Road Elementary School in Auburn. He went to the school on his own in August, introduced himself to Principal Lynda Tremaine and asked if he could possibly mentor kids who might be struggling. At the time, Newton was a relative unknown. He came to the school every Monday to meet with a group of grade boys in desperate need of a role model. Even as he emerged as one of the most dynamic players in the game, his dedication to the school and those students didn’t waver. He kept coming each Monday, going over homework with the youngsters and talking to them about their behavior and their goals. He donated his fee from an appearance on the David Letterman Show after he was named the Heisman Trophy winner, all $200 of it, to the school. After Newton was drafted by the Panthers and he took the first steps in his professional life, he maintained contact with the school, participating in an April conference call with the students he mentored. Newton shrugs off any praise for his work with the students, saying it’s an easy decision for him to donate his time to kids in need. “A lot of times, especially in this day and time, a lot of children don’t have father figures or anybody they can sit down with and just express how they really feel about whatever is going on in their life,” Newton told the Columbus Ledger-Enquirer. “We do know that kids the age of 6, 7, 8 or through 13, they do have feelings, too. They’re growing right in front of our eyes. In November, the students at Wrights Mill surprised Newton with their own rendition of Auburn’s team entrance song “All I Do Is Win.” The students performed “All I Do Is Read” for a delighted Newton. “It put a warmth in my heart to say look at these kids, look what they’re doing,” Newton said. “He’s a big guy with a big heart. He means the world to us,” Tremaine said. Tomorrow in Part IV of The Curious Case of Cameron Newton, the Never to Yield Foundation will focus on how Auburn players and coaches were impacted by the drumbeat of negativity and consider potential sources for the unprecedented animosity. Thank you so much for this series. This installment brought tears to my eyes. As a veterinarian in Florida I get to work with or be associated with graduates of other schools, mainly in my area we have Auburn, Georgia and Florida grads. I found the hatred of Cam Newton to be the worst among the Florida graduates. The did nothing but say how much of a criminal was, that they knew he cheated at UF, they new that he was a theif at UF, they knew this and they knew that because they had gone to UF and had inside knowledge (BS). All they knew was jealousy. What they forget is we all meet and talk SEC football monthly and I remember hearing about this kid from GA that was Tebow’s heir apparent and how great he would be and was. What a fine kid this incomming freshman was. He came from a great home, his father was a preacher, he had a great homelife, etc. I even beleived they thought he had superpowers almost as legendary as Tebow’s. Who could this person be, well it was none other than Cam Newton. Now fast forward a couple of years, Tebow is gone, Cam is gone and John Brantly is QB of the gators (sometimes). They are a team without a leader, they are a team without an identity, they are a team without a QB. Now these same gator alums who thought Cam was the second comming of Tebow now vilify him. I asked one of the more rational gators I knew at the end of season what they would have been like with Cam, his answer was National Champion. I then asked him if he could, would he take Cam back. His answer was an immediate yes. Yes even gator nation was fueled by petty jealousy last year. Lets not get started on the toothless mullet head bammers. Ausome story …. thanks for sharing! It is amazing the hate people have for Cam Newton. And if you read the article, the Carolina Panthers GM said they researched all of it, and found NOTHING to verify the attacks on his character. Even called out members of the Florida program about the lies.. But why hasn’t that been reported on ESPN? Great series of articles, and look forward to part 4. Great articles! Thank YOU! WDE! PAAAAWWWLLL….that dern Never To Yield is at it agin. They’s tryin’ to make ole Scam Newton look like a good guy. But you know thuh hammers a comin’ down, dontcha’ PAAAWWWWLLL??? ESPN tried to ruin Cam Newton, and Auburn, and their run for the BCS in 2010. Joe Schad in particular was only too happy to spread lies, rumors, and innuendo with no basis in fact. Tim Brando was another media goob who was happy to spread lies. Instead of celebrating possibly the most gifted athlete to ever play the game of college football, jealous fans, coaches, and the media did everything they could to damage his life and his season. All those entities against a 21 year old college kid who had the audacity to be enormously talented…and an Auburn Tiger. It is a blight and a disgrace on college athletics the way Cam Newton was treated, and is still treated today after an exhaustive, unprecedented investigation turned up ABSOLUTELY NOTHING. I’m so glad to see the NtY setting the record straight. Auburn fans this fall should mute the volume on all ESPN broadcasts of Auburn games and listen to Rod Bramblett on the Auburn Radio Network instead. Don’t you know? Cam wasn’t even the best player in the SEC last year. How could he be the best in the nation or in the history of college football? Jealousy is an ugly, vicious and hateful thing when it is allowed to take hold and spread. That’s what we saw in college football in 2010. Cam Newton was possibly the best athlete to ever play college football, and he should have been praised for his abilities, and enjoyed by anyone who loves the game. Cam was a once in a lifetime college quarterback, but a spiteful campaign of envy clouded the vision of fans from other colleges, and spread into mainstream media in an unprecedented hate-fest on one 21 year old college kid who had the audacity to be great while playing for Auburn University. Not only does what happened to this young man say a lot about what’s wrong with the media in this country, it also shows what’s become wrong with people. Cam Newton did not deserve to have his reputation shredded based on nothing but rumor, lies, and hate. The world of college football owes him a huge apology,along with one offered to Auburn University, and I’d like to see Joe Schad and ESPN be the first to do it publicly. I know they won’t….but it doesn’t mean they shouldn’t anyway. 2 Chronicles 20:17 ” You will not have to fight this battle…STAND FIRM and see the DELIVERANCE the LORD will give you…” I am very proud that in my son’s closet there is an I STAND WITH CAM shirt. And I think it no coincidence that Bishop Newton’s church is the Holy Zion Center for Deliverance. Ultimately, this has been a spiritual battle. BTW, my daughter ran up a big parking ticket tab at AU; we just paid it and decided that parking tickets were a major fundraiser at AU, probably also true at UF. It definitely does not consign my daughter to the ranks of the scumbums for all eternity! With all the good Cam does, it’s not surprising the evildoers, were trying to bring him down. Thats just who they are….. I love and appreciate this website and all it stands for..
What an encouraging article. I am very grateful of the very idea of the NTYF; presenting a fact based, grounded approach is the best way to counter all of this ugliness and meanness. A member of my family who does work with problem children in Lee County told me about Cam showing up every week at that school “on his scooter and without an entourage” long before it hit the media. She told me the principle said to him at the start of the season, “I guess you will be too busy now to come by”, and he replied, “Oh no ma’am. I will keep coming here”, and he did. The man is a class act through and through. I heard Kirk McNair on a show in the Shoals area yesterday. He threw out the “Cam Newton didn’t go to class” rumor again. I’d like for the NtYF to squash that rumor as well. You have a great site. Unfortunately you’re preaching to the choir. The rest of the world doesn’t want to hear the truth about Cam or abou Auburn. They just want to spew their hatred. The kid that did the rap was the son of a former AU running back that wore #5, Smokin’ Joe Frasier! How ironic and cool is that?